Amidst all the great pulp thrills and features in Sky Fighters, they ran a true story feature collected by Ace Williams wherein famous War Aces would tell actual true accounts of thrilling moments in their fighting lives! This time we have German Flying Corp Sergeant Take Engmann’s most thrilling sky fight! All the great heroes of the war in the air did not fly single-seater fighting planes, and all of the heroes did not accomplish their missions single handed. Some of the great feats were accomplised by the pilots of the bigger, bulkier, clumsier, two and three-seater observation and bombing planes. Sergeant Engmann was one of the heroes of this latter class. 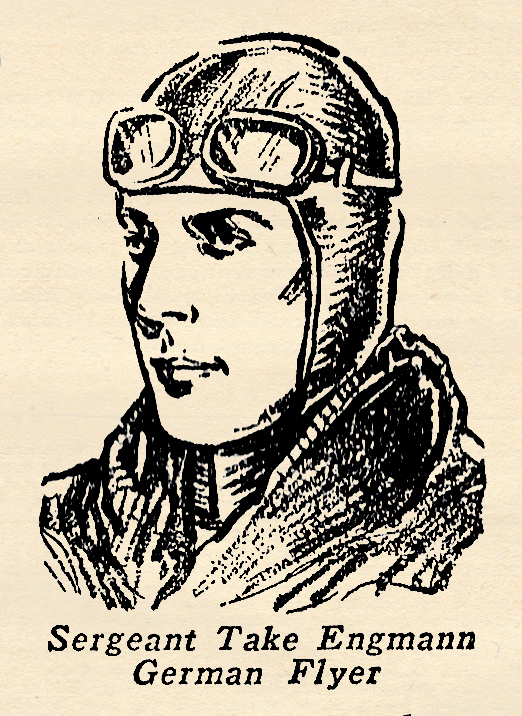 Obscure, reticent, retiring by nature, his own part in the many successful missions accomplished by the greatest of all German observation aces, Captain Heydemarck, whose pilot he was, marks him as one of the outstanding flyers of the war. Between them, flying together, they accounted for over a dozen Allied Planes, despite the fact that destroying enemy aircraft was not their primary duty. The account below is from one of the few written records Engmann left. CAPTAIN HEYDEMARCK was given the initial mission of photographing a Russian concentration camp in France and plotting it on our maps of the enemy terrain, so that our night bombers might attack it later. But we decided to do a little bombing of our own, so I loaded our plane to the limit with forty kilo bombs. The morning mists still lay on the hills and valleys of the Marne when we flew over the lines at 6 a.m.
By using the rising clouds as a mask for our entry, I managed to skip from one to another and keep concealed from enemy patrols. When we got over Mailly, the clouds had broken some, and the morning sun began to break through. The Russian camp lay beneath us. I idled the motor and nosed down, leveled off when about 300 meters over the camp. Heydemarck snapped his pictures as I circled around. As soon as he had finished, I began dropping the bombs; one, two, three. They hit squarely in the center of the camp and set the barracks on fire. I headed for home. But I had not gone far when I decided that the whole of the Allied air forces had been called on to intercept us. One after another French ships, Nieuports, Caudrons, Breguets, poked their noses through the rising mists to come hurtling at my Rumpler. I decided to make a bold show, so headed abruptly for the first Nieuport. Just as it commenced firing, I pulled into a swift turn, letting Heydemarck in the back seat take care of it, while I nosed up for the belly of another Nieuport. Heydemarck’s guns and mine spoke at the same instant, two short bursts! My Nieuport slid off on one wing, turned over, and went spinning down through the clouds. Heydemarck had managed to set fire to the other’s gas tank. More enemy planes pounced on me swiftly. Heydemarck got his guns in action, but an enemy burst clicked a right strut. Another snapped a flying wire. My left wing dragged. I zigzagged, plunged into a cloud. Saw ten more enemy planes in a group when I came out. They attacked from all sides. I don’t know what happened for several seconds. We went around and around. Heydemarck kept firing. I fired short bursts, wary of using all my ammunition. Back and forth, over and up. Then a fast dive, a quick turn. Somehow I found myself in another cloud. The enemy guns were silent. Heydemarck was smiling. In another moment the enemy formation met us again, guns blazing. I wheeled swiftly, darted back into the cloud. When I broke free of the mists, I had lost the enemy far off to my left. I banked again, raced in a straight line for the trenches. I could see them below. The Nieuports raced after me. When I skirted over the trenches I was not more than 100 feet off the ground and traveling with the speed of light. Our Archies and machine-guns protected me. We landed safely at Attigny, our pictures still intact. Not a bullet had touched them! Heydemarck pointed at our one remaining bomb: “What if one of their bullets had hit that detonator?” he said. I had forgotten to drop it in the excitement of the fight. “Yes, what if one had?” I replied. (Take) Fritz Engmann was my uncle !! He was the ten years older brother of my mother, born as Gertrud Engmann, who died in 1974. What do you think about? Do you like to contact me? – to talk with me about this “Heroe” in our family?